Click the image to visit the IBC’s CITI training website. The Office of the Vice Provost for Research, in conjunction with the Institutional Biosafety Committee, has launched a new, online training program for investigators in BSL-1 or BSL-2 labs who submit research protocols to the IBC. The training is provided through a campus-wide subscription to the Collaborative Institutional Training Initiative (CITI). 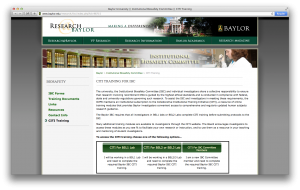 Dr. Chris Kearney, associate professor of biology and chair of Baylor’s IBC, says the new CITI training is intended to reinforce existing campus-wide standards for biosafety. Investigators planning to submit new IBC protocols for review at the committee’s spring meeting must complete CITI training prior to submission. Those investigators working on projects with current IBC approval will be required to complete the training prior to submitting their renewal applications in the fall. Click here to access the CITI training on the IBC website. Contact Dr. Chris Kearney with any questions about the new training requirements.